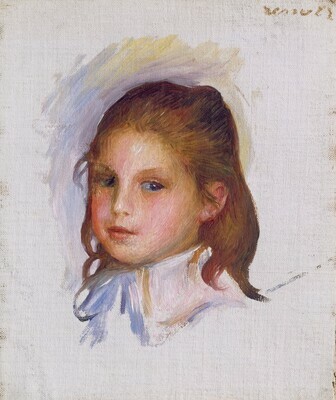 French Paintings from the Molyneux Collection, National Gallery of Art, Washington, D.C.; Museum of Modern Art, New York, 1952, unnumbered checklist, as Head of a Child. Small French Paintings from the Bequest of Ailsa Mellon Bruce. Exh. cat. National Gallery of Art, Washington, D.C., 1978: 58, repro. (continuing exhibition beginning in 1978). Vollard, Ambroise. Tableaux, Pastels & Dessins de Pierre-Auguste Renoir. Paris, 1918: II: repro. 175. Walker, John. National Gallery of Art, Washington. Rev. ed. New York, 1984: 465, no. 680, color repro. European Paintings: An Illustrated Catalogue. National Gallery of Art, Washington, 1985: 345, repro. Southgate, M. Therese. The Art of JAMA: One Hundred Covers and Essays from The Journal of the American Medical Association. St. Louis, 1997: 128-129, color repro.